What is another word for attaches? exceptional, extraordinary, emergency, Aggregated, great, handled, Undertook, most, aggregate, aggregates, added, Took, very, highly, Tony. 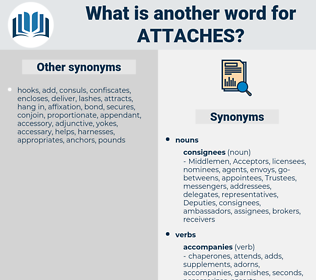 attachments, associates, connections, connectors, courts, connect, connects, aggregations, clusters, fasteners, comments, supplements, officers, ties, additions, judges, Grants, places, accords, Maps, bridges, links, suspends, plugs, logins, awards, aggregates. characterizes, entrenches, switches, matches, appreciates, hangs, emphasizes, concentrates, emphasises, acknowledges, contains, highlights, suggests, allocates, designates, consecrates, casts, integrates, classifies, assigns, interprets, Guarantees, corresponds, asserts, subscribes, exists, demonstrates, relates, accepts, administers, enhances, identifies, perceives, Charges, authorizes, creates, supports, recognises, regulates, recognizes, declares, exerts, encompasses, enshrines, contributes, underscores, governmental, specifies, contends, Governments, combines, introduces, Carries, commits, transfers, understands, adds, upholds, values, incurs, constitutes, harbours, appoints, submits, distributes, pertains, binds, acquires, mentions, conveys, reinforces, confers, special, represents, examines, affirms, treats, Measures, conforms, undertakes, removes, explains, admits, stipulates, nurtures, nourishes, deserves, lays, government, concludes, determines, stresses, empowers, Lends, renders, directs, assists, defines, proposes, maintains, regards, respects, enforces, reveals, endeavours, features, prescribes, endorses, additional, bestows, tends, concedes, estimates, associates, observes, assumes, argues, enables, fulfills, unites, encounters, belongs, throws, expresses, spheres, underlines, assesses, expects, involves, rates, shares, issues, credits, invests, entitles, connections, endangers, holds, Addresses, entrusts, feeds, occurs, exempts, exposes, Has, monitors, furnishes, blames, embodies, attempts, promotes, increases, presents, approves, fixes, notes, complies, produces, place, stems, operates, fulfils, cares, PAVES, derives, devolves, grant, Bears, announces, discusses, endows, vests, implies, entails, opens, strives, affords, counts, receives, imposes, Focuses, focusses, works, applies, draws, marks, Deems, aims, aligns, outlines, seems, envisages, extends, appears, limits, requires, fails, conducts, connectors, arises, Comes, likes, wishes, annex, annexes, spends, docks, feels, expends, wears, thinks, shows, Accorded, Leaves, believes, puts, cuffs, divides, joins, offers, Permits, remits, Faces, performs, sets, lies, finds, speaks, earmarks, brings, continues, asks, stands, intends, ready, falls, yields, Licenses, is, reserves, joint, poses, aids, supplies, releases, wants, views, allows, remembers, award, seeks, takes, Plays, logs, VOTES, ensures, Parties, ties, leads, Strikes, raises, sees, Rests, remains, breeds, serves, keeps, looks, D, deals, goes, returns, tries, judges, fields, Grants, places, accords, runs, gets, Maps, links, suspends, Does, sheds, plugs, logins, 's, awards. 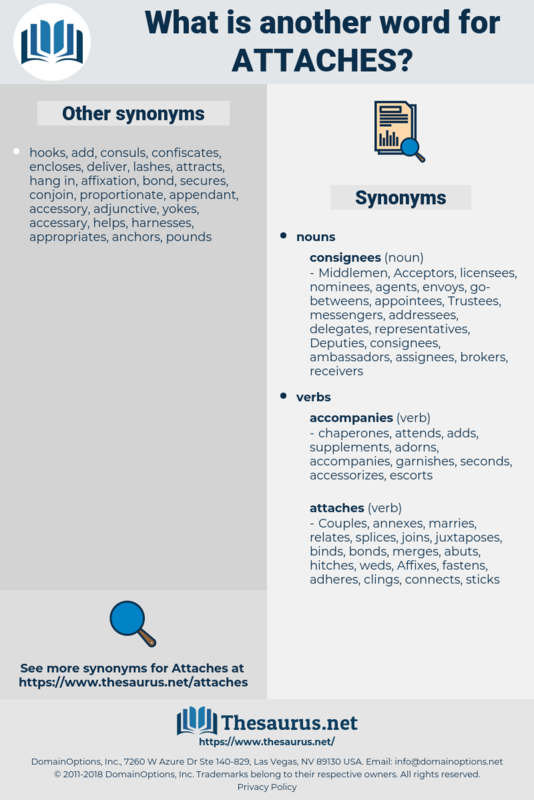 attributes, incorporates, dedicates, reaches, implements, encloses, ascribes, considers, accompanies, establishes, devotes, includes, Affixes, hands, calls, appends, delivers, refers, pays, turns, fits, engages, Gives, connection, agrees, sends, secures, provides, connects, needs, makes. When ready to change to the chrysalis each caterpillar attaches itself by silken threads to the bark of the trunk or branch of the tree. With nothing to look forward to but the next meal, the human animal attaches a preposterous importance to his feeding. aides, atsugewi, attack, adige, adios, autoicous, ataxy, ataxia, addax, adze, adz, atticus, Attache Case, aotus, at issue, aids, at sea, adagio, ataxic, adequacy, atoxic, adage, attach, ad hoc, (adj), at ease, aethusa, athos, audacious, aedes, athetosis, adduce, autoecious, autocue, attica, at odds, attic.